Disclosure: This is a compensated post in collaboration with Ashland Chamber of Commerce. As usual all opinions are my own. Thank you Ashland Chamber of Commerce for making NJB awesomeness possible. The photo above is not my photography, it is last years competition and I have permission to use it. 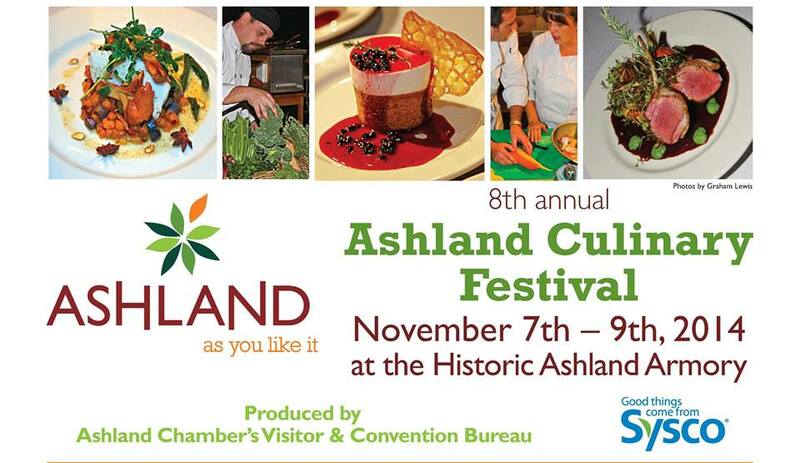 I am super excited to be a part the 8th annual Ashland Culinary Festival! This awesome event hosts twelve chefs from restaurants in Southern Oregon that compete in an Iron Chef fashion for Top Chef 2014 title. Last years winner was Chef Dustin from Larks Home Kitchen Cuisine, and they will compete again to defend the the Top Chef title of 2013. A slight change this year, Chef Dustin is in a new kitchen, but will still be competing! Follow along social media on the festivals Twitter and Facebook by checking out the hashtag~ #AshCulinaryfest. You can also follow my social media accounts to see my journey through the competition. Both Saturday and Sunday will begin with hands on workshops before the competition. You can sign up for them when you purchase your tickets, here. Events are held in the Historic Ashland Armory from Friday November 7th through Sunday November 9th. Friday night kicks off with an introduction to the amazing chefs that will be competing in this years events! Friday also includes appetizers, wine, and live entertainment. The following day things get a bit more serious for the chefs, and fun for you! Cooking commences from 12:30-2 and 3-4:30. During the cooking there is a plethora of entertainment! There is seating to view the chefs, sips & nibbles from 12-5 showcasing local food artisans and farms. Which is always a huge plus, seeing as Oregon is home to incredible wine, cheese, produce, meats, and too many awesome things and the list would be miles long. Sunday we move on to round three from 12:30-2 and round four from 3-4:30. While the cooking competition is going on, there again will be entertainment, seating, more wine, and more tasty food available for your eating pleasures form 12-5. And basically the entire time I will be also be eating my way through the amazing event, but more important, I will be judging. My roll as a judge includes checking food preparation practices, techniques used, originality and use of secret ingredients, technical execution, flavor and texture, presentation and cleanliness. So I have quite the job to do, and I am very excited and humbled to be a part of this competition. These incredible chefs take their time and talents to cook for us, to have us judge them for a title. So best believe I will be taking this as seriously as they do, and I look forward to this event. I hope to see you there, and make sure to say hi! Don’t wait, go get your tickets! Sounds fun, wish I lived closer! Right?!! Wish you did too. Sounds like such a fun event.